NOTE TO READERS: Due to a computer crash, today's edition of The 'Skeeter Bites Report is being posted three hours later than normal. We apologize for any inconvenience this delay might have caused. The television images were startling: As President Obama addressed Congress and the nation on health-care reform Wednesday night, the cameras showed many Republican members of Congress displaying their contempt for the president's reform push, with some holding up signs reading "What Bill?" and "What Plan?" and copies of GOP-sponsored bills rejected by majority Democrats, while others were scanning their BlackBerrys while Obama spoke. 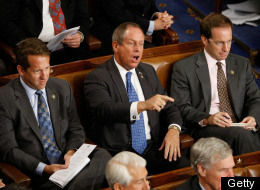 Then the House chamber's microphones picked up the voice of a previously little-known Republican from South Carolina openly heckling Obama -- the first time in memory that a sitting member of Congress showed such blatant disrespect for a president while he addressed the lawmakers -- calling Obama a liar after the president said his reform plan would not cover illegal immigrants. But that's not all. According to a report on HuffingtonPost.com, another Republican congressman challenged Obama when the president told the lawmakers that claims by his right-wing opponents that his proposal would establish so-called "death panels" on end-of-life matters was "a lie" by demanding that he "Read the bill!" -- a common chant used by opponents at lat month's explosive town hall meetings. And a third Republican congressman loudly dismissed with a sarcastic "Ha!" the president's assertion that he had "no interest in putting insurance companies out of business," the Web site reported. Apparently emboldened by the fierce condemnation of the president's health-care reform proposals displayed by opponents at town-hall meetings across the country on the matter, House Republicans, in particular, were in no mood to back down from their own united -- and apparently implacable -- opposition. But Wilson's outburst clearly crossed the line, according to HuffPost. He was booed loudly by Democrats and Republicans alike. "Shame on you!" shouted one spectator. "Throw him out!" shouted another. First Lady Michelle Obama, who was seated above and behind Wilson in the visitors' gallery, was overheard shouting "Damn!" as she shook her head in disgust. Within an hour after the president's address. Wilson issued an apology. "This evening I let my emotions get the best of me when listening to the president's remarks regarding the coverage of illegal immigrants in the health care bill," he said. "While I disagree with the president's statement, my comments were inappropriate and regrettable. I extend sincere apologies to the President for this lack of civility." Wilson also called the White House to apologize. Wilson's outburst was roundly condemned by Republicans and Democrats alike. Appearing on CNN's "Larry King Live" minutes after the president's address, Senator John McCain (R-Arizona) said he found Wilson's remarks "totally disrespectful -- [there's] no place for it in that setting or any other and he should apologize immediately." On the same program, Representative Jeff Flake (R-Arizona) said, "I thought that was unfortunate. [Obama's] the president. He deserves more respect than that." Democrats were furious. "Nineteen years [in the House and] never, never have I seen anything like this," said an angry Representative Rosa DeLauro (D-Connecticut). "I thought it was very inappropriate behavior, to hold up signs. None of us ever would have done that," said Representative Henry Waxman (D-California). "I don't think in the Congress of the United States there ought to be catcalls, or people standing up and yelling comments or holding up signs." Representative John Dingell (D-Michigan), the House's longest-serving member -- whose father, John Sr., introduced a health-care reform bill as far back as 1943 -- said he was not impressed by the GOP's antics. "Well, you've got to understand: They're Republicans. They're just doing what comes natural," he told HuffPost. But by far the most barbed reaction came from MSNBC morning host Joe Scarborough, a former Republican congressman. “Whoever shouted out that the president was lying is a dumbass who should show the president some respect!” Scarborough wrote in a posting on Twitter. GOP'S DISRESPECT OF OBAMA UNPRECEDENTED -- IS IT RACIALLY TINGED? It's pretty clear by now that Republicans -- especially those in the House -- are in no mood to back down from their fierce and increasingly implacable opposition to health-care reform. But their boorish behavior during the president's speech strongly suggests to The 'Skeeter Bites Report that the Republicans also might be emboldened by something far uglier: A refusal to accept the decision last November by a 54 percent majority of the American electorate to entrust, for the first time in the nation's history, the the most powerful job in the world to a black man. Are we the only ones who noticed from viewing the TV images that the Republicans who displayed such open contempt for the president were all white male Southerners? Is it merely a coincidence that Wilson, the GOP congressman who made the "You Lie!" outburst, is a conservative white male Southerner from South Carolina? Can anyone recall any of Obama's predecessors -- including George W. Bush, Bill Clinton, Ronald Reagan, Jimmy Carter and Richard Nixon -- ever receiving this kind of treatment by members of the opposition party while addressing a joint session of Congress? We can't. We are, therefore, forced to ask this question; Partisan loyalties aside, would the Republicans have displayed this much contempt for the president of the United States if Obama were white? As much as the Republicans despised Clinton, they never subjected him to that kind of open display of disrespect even as they impeached him in 1999 -- and remember, the Republicans controlled both houses of Congress back then. Likewise, the Democrats, for all of their dislike of Nixon, never resorted to such open displays of contempt -- not even when Congress began impeachment proceedings against him over the Watergate scandal in 1974. HOW ELSE TO EXPLAIN GOP MOVING FARTHER AND FARTHER TO THE RIGHT? It is becoming more and more difficult to avoid coming to the conclusion that there is more than partisan motivation behind the Republicans' hardening opposition to Obama's health-care proposals. This is, in fact, a hardening of the GOP's opposition to Obama's entire presidency, based on their nearly unanimous opposition to his emergency economic stimulus package and the solid opposition to his plans for dealing with climate change and energy independence. The reason for the hardening opposition should be as plain as day: The Republicans have for months now been sucking up to the rabid demagogues of right-wing talk radio, led by Rush Limbaugh, and of a certain right-leaning cable news channel that's having to deal with a growing advertiser boycott against one of its rising stars, Glenn Beck. Of course, there's more to it than that: The Republican Party's voting base has shrunk to where it's now where the Democratic Party's voting base was for much of its history prior to the end of World War II: almost lily-white, mostly Southern, overwhelmingly male and fiercely conservative -- and moving ever farther rightward, away from the American political mainstream. Indeed, the GOP is moving so far to the right that it is at the point where the party is in danger of becoming a xenophobic, neo-fascist fringe party similar to the British National Party, France's National Front, Austria's Radical Party, Germany's National Democratic Party and the Netherlands' Freedom Party. The GOP cannot remain viable with the majority of the American people if it continues on its rightward trajectory.